SWTOR: Will the game match the hype? As an avid science fiction/fantasy fan, one thing I’ve witnessed over the years is a shortage of titles in the space MMORPG genre. I can count the “biggies” on one hand: Earth & Beyond, Freelancer, Star Wars Galaxies, Eve Online and Start Trek Online. E&B (my personal all-time favorite) & Freelancer are fossils; SWG is wallowing in Steam purgatory; Eve plays like a graphics-enhanced collaborative dbms; and Star Trek Online is – well… hmmm. I was on the closed & open beta teams for this game and it’s still a major WIP, even after months of being in full release. Up and coming sci-fi MMORPGs include Stargate Worlds, which looks like a primarily ground-based science fiction 3rd person shooter ala’ Tabula Rasa. And then there is Star Wars The Old Republic. I hold out hope for this game for three reasons: Bioware, LucasArts and EA. Bioware is the primary developer and I’ve thoroughly enjoyed their work over the years. 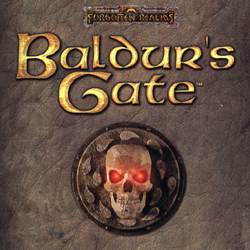 BW’s Baldur’s Gate was the first official AD&D PC video game release after Wizards of the Coast acquired TSR in 1997. Both Baldur’s Gate and its successor Icewindale translated seamlessly to online multiplayer. We have friends all over the U.S. who joined in for Friday night 5-player adventures that lasted years. Neverwinter Nights is still an all-time favorite RPG of mine, as is Star Wars Knights Of The Old Republic – the penultimate Star Wars RPG imho. Bioware co-developed KOTOR with LucasArts who also published Star Wars Galaxies, in addition to a sweet little Star Wars PC CDROM game titled ‘Episode I Racer‘… a fun as hell white knuckler based on the ‘Phantom Menace’ pod races. Electronic Arts published “The Sims” and is competing with Blizzard to become the Microsoft of the video game publishing industry. While I consider The Sims game a tad pubescent, it continues to flourish after 10 years. So between these three companies the ingredients for MMORPG design, publication and distribution success – as well as cordon bleu chefs to cook the feast – are all in place. So what are the expectations? EA’s expectations are simple: they want this game to financially blow Star Trek Online and World of Warcraft out of the water. The developers’ goals are pretty lofty too. For instance, instead of the usual text and a few canned sound bites, Bioware & LucasArts are incorporating complete voiceover scripts into NPC interactions ala’ Knights Of The Old Republic. 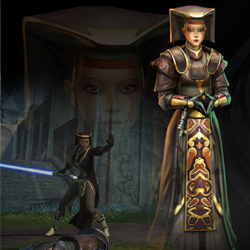 In fact, SWTOR is being fashioned as a gloriously produced Lucasfilms MMO version of KOTOR. But will it work is the real question. Cryptic learned the hard way with Star Trek Online that cutting infrastructure corners to meet an investor-imposed release deadline is stupid. Once the gameplay mechanics are in place, going back to reinvent them because of a bad or incomplete design can be a bottom line killer. So it has to be done right the first time. When one considers the sheer scope of The Old Republic, making everyone happy right out of the box could prove difficult. Perusing the SWTOR online community, one sees divides in how the people who will ultimately pay to play the game want the game to physically play. Ya… those voiceovers are way cool. But what if someone in the party is in a time crunch and wants to blow right through the NPC speeches? This isn’t single player KOTOR where they can pause, save and pick it up later. Will a player be able to replay those segments like revisiting a quest log? What about party interaction? There is light side/dark side faction rep and experience to be gained based on the party’s response. But what about individual responses? What if one of the party members wants to select a different direction? Will the players have to sit through multiple dialogue trees? Another aspect to any Star Wars game is combat. Watching the E3 multiplayer combat demo was encouraging. It appeared to mimic World of Warcraft’s combat mechanics… and that’s a good thing. WoW allows the player to zoom into 1st-person mode, strafe while jumping over or on top of things and spinning around. By comparison, KOTOR’s combat is limited – almost to the point of being claustrophobic at times. In KOTOR, there’s no 1st-person, no jumping and no spinning – essentially handcuffing three really big freedom of movement options that WoW players take for granted. If EA/BW/LA are serious about competing with Blizzard and World of Warcraft, they’ll need core defectors. WoW players won’t defect to an inferior combat and movement system, regardless of how rich the storytelling is. For any MMO, having an open-ended and minimally-instanced gaming experience is probably the most important element of gameplay. What can I do if I don’t want to be led around by the nose following storylines? What if I’m not in the mood for PvP? What if tonight I have no desire to raid? What if I just want to mindlessly explore, maybe farm a bit and serendipidously get into trouble? What if I feel like getting into a barfight then blasting my way out of a Mos Eisley cantina, fighting off enemy fighters before making the jump to lightspeed? WoW possesses those core game mechanics, KOTOR does not. So I’m hoping a World of Warcraft-level open ended environment becomes the pervasive environment in SWTOR. Newly added to The Old Republic’s gameplay options arsenal is space combat. Bioware is keeping this so under wraps that details to this point are pretty much speculative. But here’s what I’d like to see: optional 1st or 3rd person cameras from the cockpit in single passenger vehicles, and optional 1st or 3rd person cameras in a starship where players can actually operate their stations. Am I a gunner? Then I want to play 1st person inside the turret. Am I a pilot or the navigator? 1st person in my chair looking out the window with the controls in front of me would seriously trip my trigger. Am I a technician, medic or mechanic? Same thing but windows would be optional. Though spacewalking in the middle of a battle to affect external repairs on a starship could prove intense. The good news is that much is going on with Star Wars The Old Republic. There are lofty expectations based on what Bioware is leaking to the press and its community. If they can make SWTOR into everything that gameplayers are praying for in a Star Wars MMORPG universe, then Star Wars The Old Republic should supplant World of Warcraft as the MMO industry’s 600lb gorilla. Hello, i think that i saw you visited my weblog thus i came to “return the favor”. I’m trying to find things to enhance my site! I suppose its ok to use a few of your ideas!! Hi Aldo! Ya… I think we traced your post from our ‘It’s Just a Movie’ blog. We do manual traces instead of promiscuously allowing trackbacks to protect our viewers from spammers and malicious links. As long as copyrights, trademarks or patents aren’t infringed (there are some of each on this site) feel free to use our site as inspiration for your own creations. Hey there, You’ve done a great job. I will certainly digg it and personally recommend to my blogging friends. I really hope it matches the hype. It’s looking really good and I’ve ordered the CE. Me too! Redeemed my early access code and can’t wait to take it out for a spin in an open beta crowd. This is the second time I have been drawn your blog in the last couple of weeks. Guess like I should bookmark it huh, good stuff. Sweet website, super style and design, real clean and friendly.